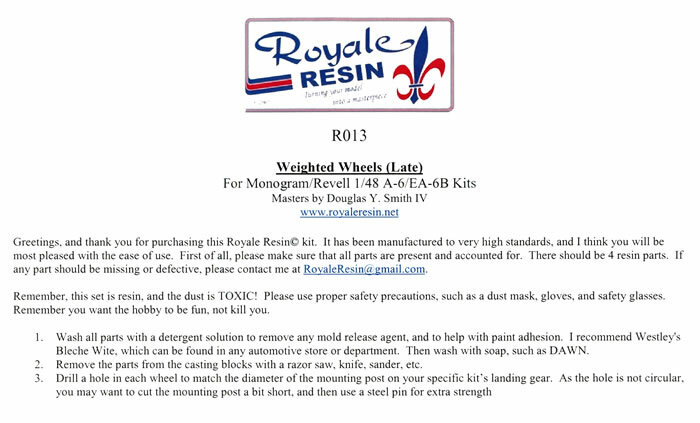 all available online from Royale Resin's website. Paypal and Money Orders accepted. 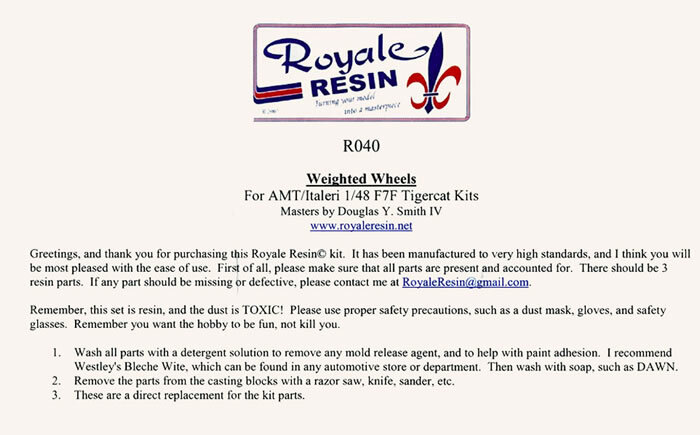 Royale Resin is a relative newcomer to the world of resin detail parts. 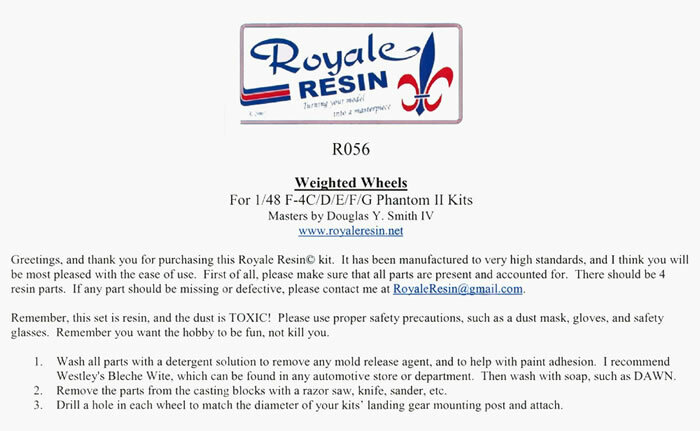 A husband and wife team based in the USA they specialise in producing resin upgrades, conversions and accessories for 1/48 scale model aircraft. 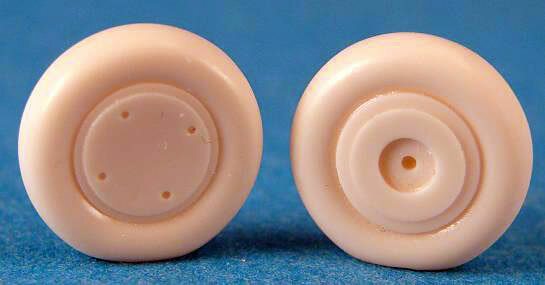 This set includes the mains and nose wheels for late Grumman A-6 Intruders and EA-6B Prowlers. 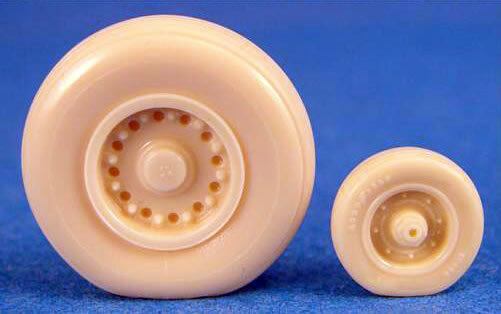 The wheels have been cast with a flat bottom and a hint of sidewall bulging as appropriate to the highly inflated ones worn by the one-to-one-scale A-6 and EA-6Bs operated by the U.S. Navy. 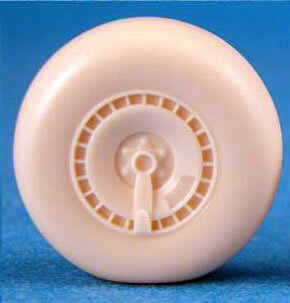 Although the set is designed to replace the ones in the Monogram/Revell kits it will also be welcomed by those who find the three piece wheels in the recently released Kinetic EA-6B irksome. 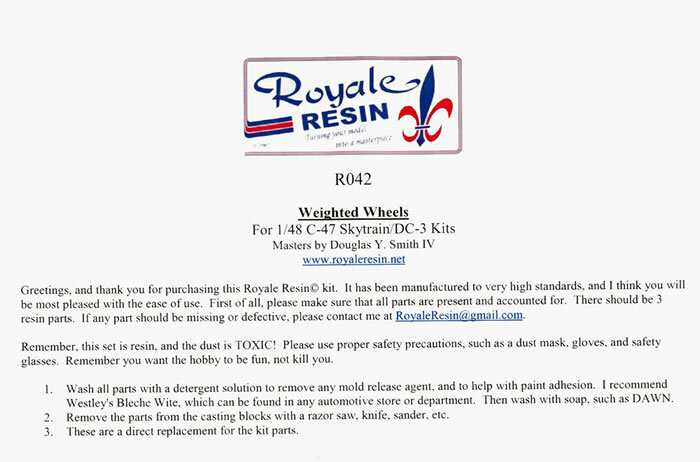 Royale Resin also produce a set for early model A6/EA-6Bs (R013). 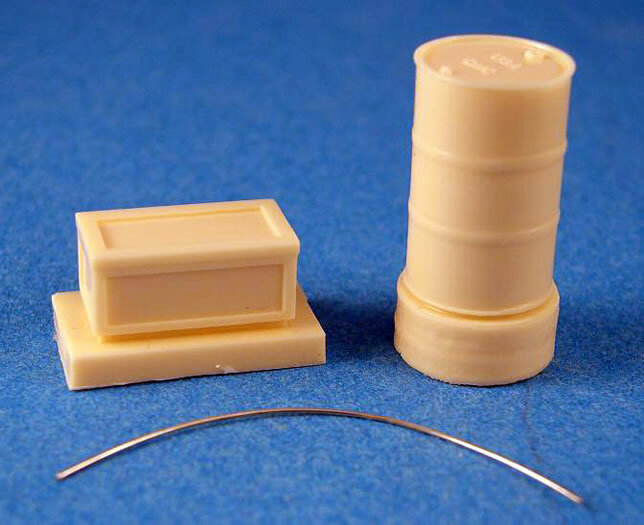 A two piece set designed to replace the ones found in the kit. The wheels are for the land-based version of the Kingfisher, not the ones used on the beaching gear for float equipped Kingfishers. A definite improvement on what is in the now ancient but still good Monogram Kingfisher kit. 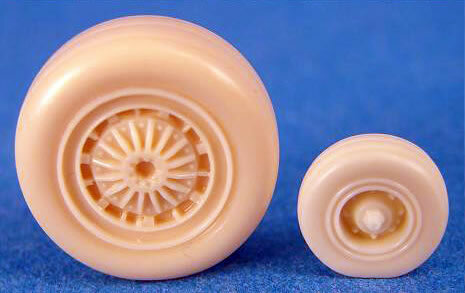 This set includes the two mains and a single nose diamond treaded and subtly weighted wheels for AMT/Ertl/Italeri F7F Tigercat kits. If ever there was a need to replace kit wheels it would have to be for this kit. 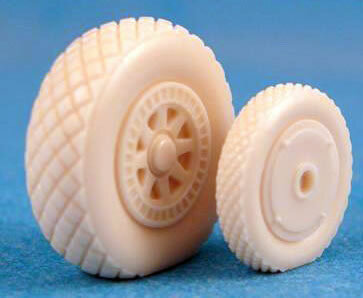 The ones found in the kit are two-part affairs that are shod with roll-on imitation rubber tyres. I’ll be honest here, I am not a fan of these types of tyres as they are neigh on impossible to weather them and make them look like. An added disadvantage of the kit ones are that, if left in contact with the plastic of the kit will melt the part that they are in contact with! 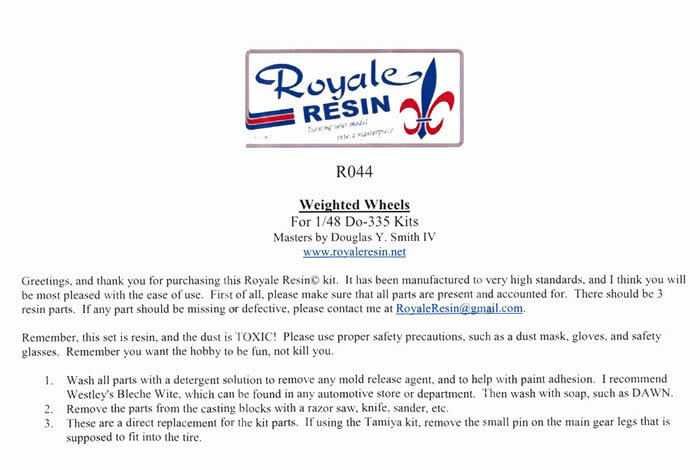 This release from Royale Resin takes care of the problem as well as providing you with realistically weighted tyres too. Following on from the previous set, this one includes a fuel drum and a box to replace the ones provided in the kit parts. 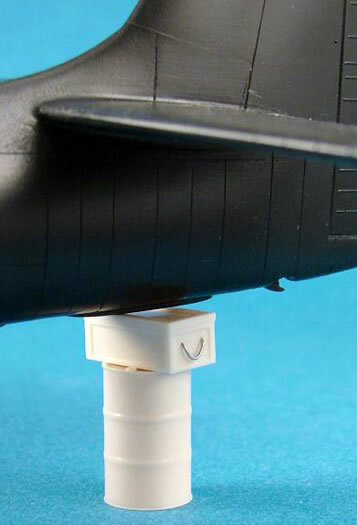 One of the issues with the AMT/Ertl/Italeri Tigercat kits is that the nose gear is very delicate and as such is liable to suffer when you add weight to the nose to make the kit stand on its undercarriage. An easy out is to do what they U.S. Navy and Marine Corps did, place a fuel drum under the rear fuselage when the aircraft was unfuelled and tended to fall back and rest on the rear of the fuselage. 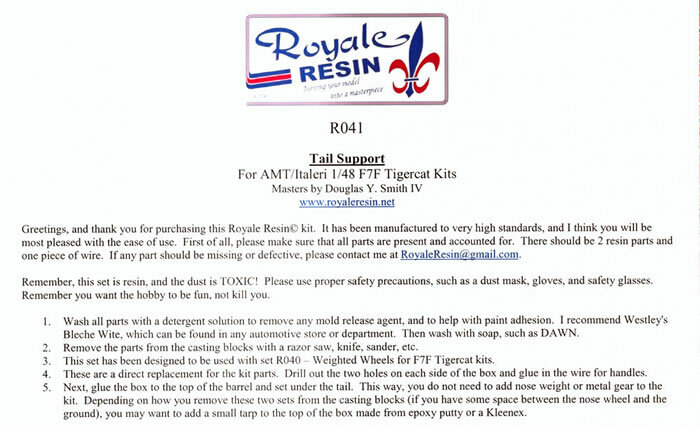 To their credit AMT did address this when they designed the kit and provided a fuel drum and box in the kit. 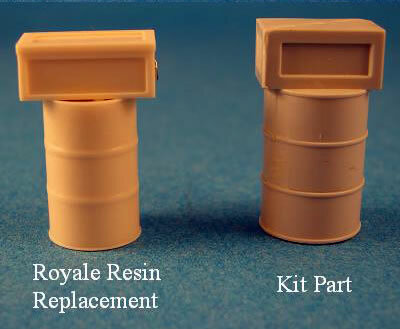 This set from Royale resin replaces these kit parts with far better detailed ones. They even provide a short length of fuse wire to replicate the rope handles of the box. 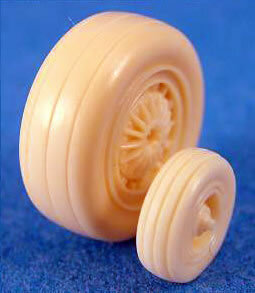 This set includes the two mains and a tail wheel for Douglas C-47/DC-3 kits. 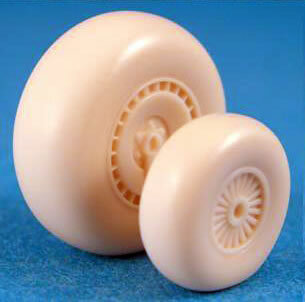 The wheels have a circumferential tread and a subtle weighted appearance cast into them. The candidates for this set are the Monogram/Revell and the Trumpeter DC-3/C-47 kits. The wheels in the former kit are not too bad really but do not exhibit “weighting” whilst the latter are two-part affairs with roll-on rubber tyres. 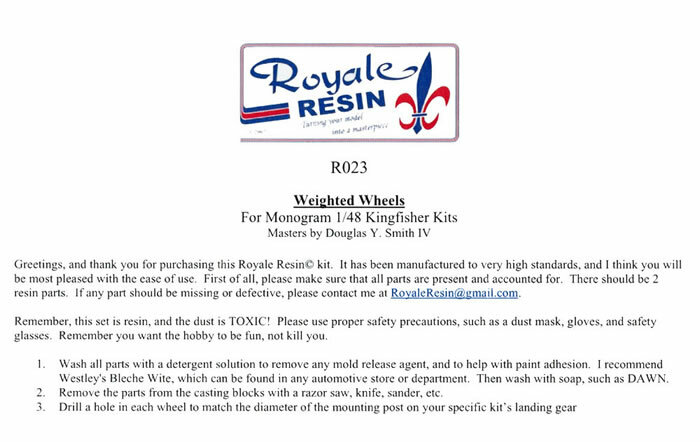 Again, I’m not a fan of these and welcome this set from Royale Resin which will find their way onto the Trumpeter kit in my stash. 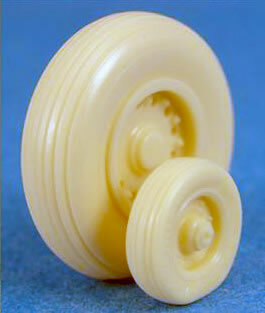 This set includes the two mains and a tail wheel for Do-335 Pfeil kits. The candidate kits here are the ancient Monogram one and the newer Tamiya one. 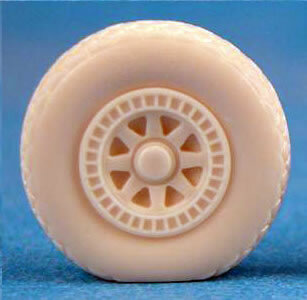 The tyres have been cast as smooth (no tread) as well as subtly weighted. 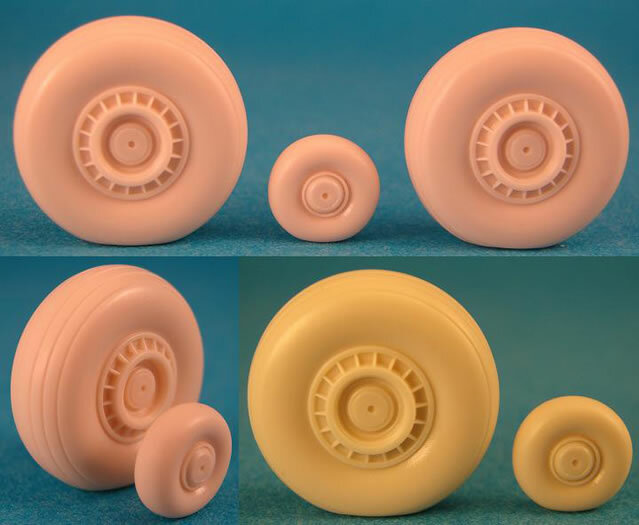 Not a wheel set this time, this set provides you with two replacement spinner bases for any Junkers Jumo engined 1/48 Ju-88 kit. 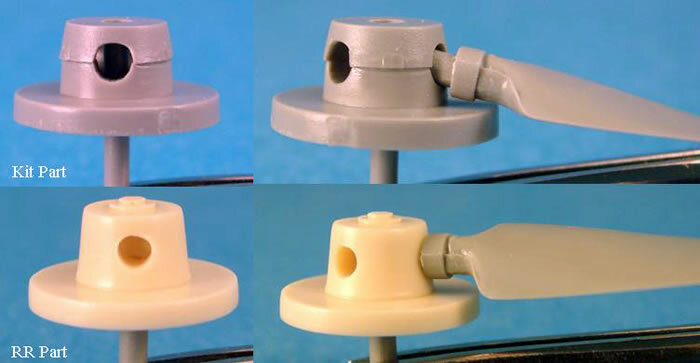 If you have ever built a 1/48 Dragon Ju-88 kit you would have found that the holes into which the base of the propeller blades slot into are way too big. Not really too much of a problem but it does lead to incorrect alignment of the blades unless you watch them like a hawk and constantly adjust the position of the blades as the glue sets up. This set from Contact Resin takes care of that for you by providing a base with smaller holes as well as a jig to rest the edges blades on whilst the glue sets up. 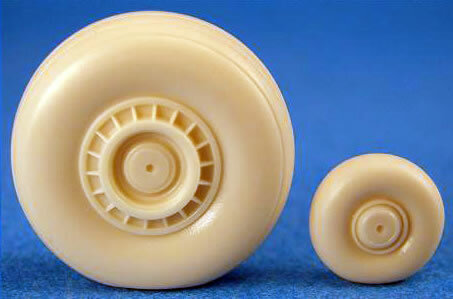 This set includes the two mains and two nose gear wheels and tyres for 1/48 F-4C/D/E/F/G or RF-4C Phantom II kits. The tyres are circumferentially treaded and exhibit subtle weighting. In summary, these are first rate accessories. The casting of each and every sample part I received is first rate with absolutely no pin holes or miscasts. An added bonus is that there is a clear and definite separation between the part and the casting plug that will make the task of separation and clean up a breeze. 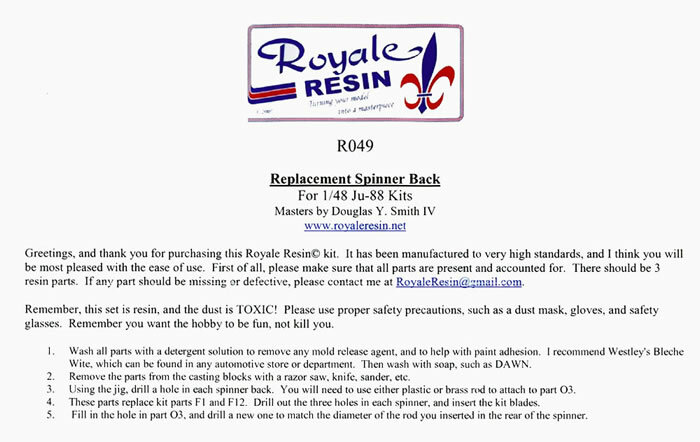 Each set comes packed in a clear plastic zip-loc bag along with brief but adequate instructions and notes that remind you that resin is toxic and the precautions you need to take when preparing the parts for use.